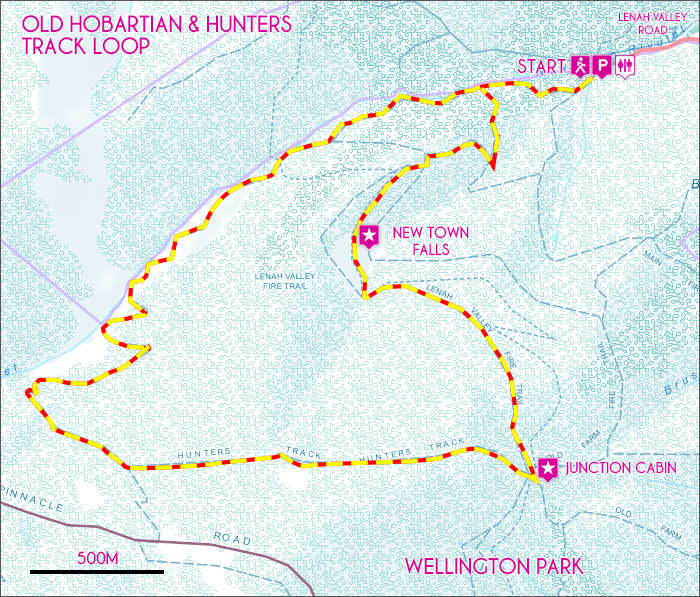 There are many alternative walking routes available within Wellington Park. 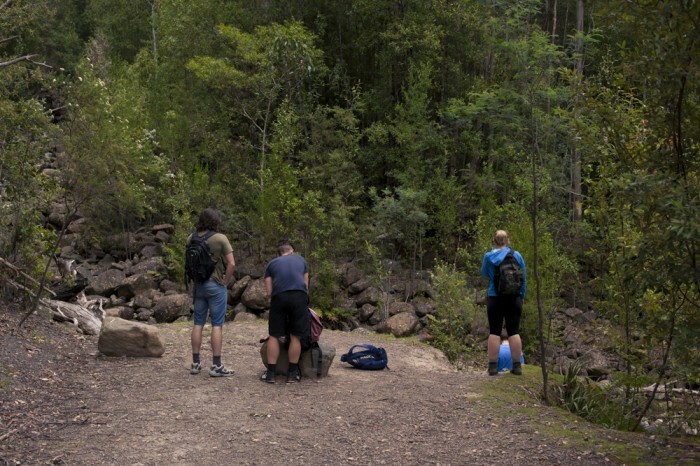 This particular walk begins and ends at the Lenah Valley Road trailhead, taking in lovely views of Hobart’s northern suburbs, Junction Cabin and Newtown Falls along the way. From Lenah Valley Road stick to the right hand fire trail for the first 600m. 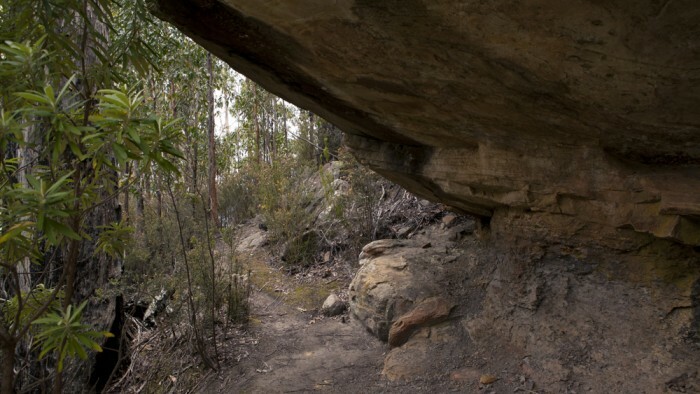 The trail climbs gently reaching an easily accessible section of the New Town Rivulet before continuing up the rock steps of the Lenah Valley Track signposted nearby. The trail climbs for the next 20 minutes, passing a small hut ruin before continuing uphill via the Old Hobartian Track. For the next 45 minutes the trail climbs, zigzagging alongside the New Town Rivulet. At one point the trail ducks under an impressive sandstone cliff face signed by decades of visitors. Shortly after, a junction is reached and the trail continue to the right. 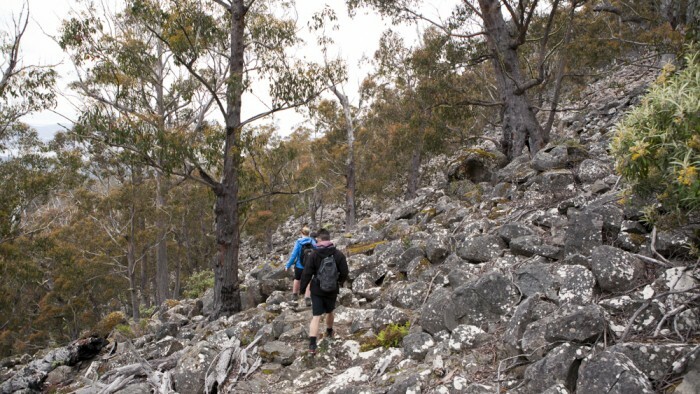 The trail steadily climbs for the next 1km before reaching the Hunters Track. From here we head downhill towards Junction Cabin. During the short descent to the cabin numerous rock sprees provide lovely views of Hobart’s northern suburbs. Once at Junction Cabin the loop trail returns to the carpark via the Lenah Valley Track, crossing New Town Falls after 2km. From here the track meets quickly reunites with the New Town Rivulet and Lenah Valley trailhead. View Google Map Directions Head North from the center of Hobart via Elizabeth Street. Once on the outskirts of North Hobart turn left onto Augusta Road. Follow Augusta road for 2km before it turns into Lenah Valley Road. Follow this road to its end, 4km away. This loop walk starts and finishes from this carpark.